Is there some kind of unspoken or spoken rule that people have to hate Vince Vaughn? I’ve heard the argument so many times before. Something about Vaughn playing the same role over and over again, and it’s getting old. First of all, I can see that sometimes, but not always, and I have nothing wrong with his style of comedy. He’s a funny guy who has the proven ability to be serious when he needs to be. That being said, Delivery Man hasn’t gotten the best reviews: partially because of people’s anti-bias against the actor, partially because people are so dense with their love for the original film that they immediately start comparing. I’m actually glad this is the only variation of the story I’ve seen, because I thought it was wonderful. 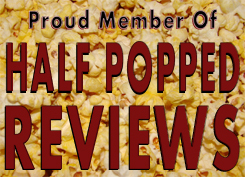 I’m pleasantly surprised, but I really, really enjoyed this flick. 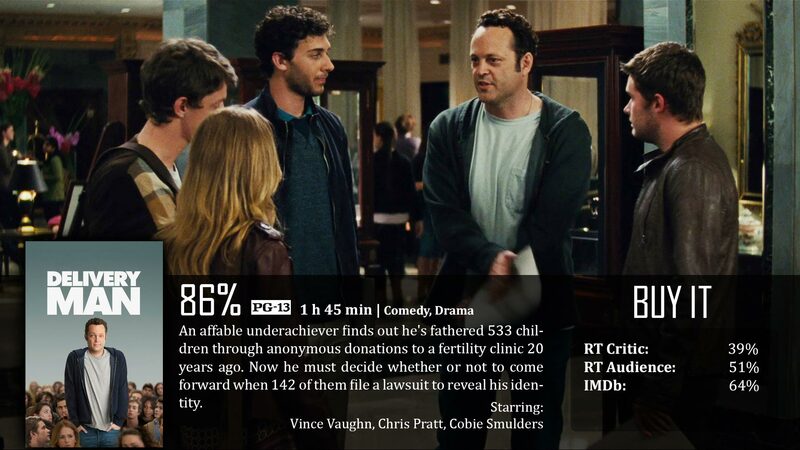 Delivery Man stars Vince Vaughn as David, a man with a pretty lame job – meat delivery. However, when his girlfriend tells him that she is pregnant, he is forced to put his life into perspective, and he really wants to have the child with her. The problem is, thanks to his childish ways, she’s thinking seriously about raising the child alone, so David sets forth to prove himself to her. That’s when he learns that years ago, he gave almost 700 donations at the sperm bank and sired 533 kids, about 200 of which have formed a counseling group to find him. One by one he gets to know these kids, and he falls in love with each of them all for different reasons. Meanwhile, a trial goes on about the importance of anonymity at donation centers like that, and David must choose what’s more important to him. Why must people hate Vince Vaughn so much? Okay, yeah, there were elements here and there that were similar to his other works. Sure, the flick is pretty predictable in the end, but it’s also inspirational, heartwarming, with an original story and amazing premise. I’ve never seen anything like it before, and I don’t care that it’s a remake, I’m never going to see the original anyway. The story presented here was really important, and I was able to find a connection with everyone, including David (and not just because he and I share the same name). Because I know a thing or two about estranged parenthood and wanting to be the perfect father, but not knowing how to go about that. That’s something I feel very close to, and this film got to me a little. I didn’t break down in tears, but the movie is definitely emotional, and I could see it making others cry – easily. This is what my website is all about. I see a lot of movies, but my tagline is mostly my goal, because there are plenty of under-appreciated films out there completely due to unfair bias. Oh it’s Vince Vaughn? Yuck, no thank you, very much! Get over yourself and ignore the fact that this is a remake, and you’ll find the movie is done very well. No, Vince Vaughn isn’t the best actor, nor is anyone in the flick, but the chemistry that glues them together so well is enough for none of that to matter. There is so much diversity, and so many places where the movie could have gone wrong, but instead…it worked really well. So, if I had one bad thing about it, I would probably stick with story progression. I’m not a huge fan of coming-of-age, which is kind of what this film is going for. Big baby learning to mature, etc. etc. Here’s the thing about the rest of it, it would make an incredible TV show, meet a new kid every episode? See this father learn the best and worst attributes of his kids, and still love them no matter what…I would watch that. What they set out for this film is truly commendable, and for the most part, I truly believe that they accomplished it. Delivery Man has so much heart and originality that it’s hard to ignore. It’s sweet, it’s emotional, it’s honest, and it’s funny when appropriate. It’s a journey of self-discovery, which is not something I normally care about – but in this case…well done. Peoples biased opinions against Vince Vaughn and insistence to compare a film to the original will immediately turn people away from an otherwise great film. There are two interpretations, get over it, the movie is good. I saw this film when it came out and I didn’t know anything about the original, Vaughn does play the same role but he’s still funny! I thought this film was good, nothing special, it didn’t get watched too much either due to the competition with 12 Years etc, but it’s surprising 🙂 good review, I have this a 3.5/5 check it out somewhere on my blog if you want, glad you found this one decent like me! I haven’t watched the original movie and not a fan of Vince Vaughn. But having these two facts made me appreciate the movie. Telling from a view of a person that have not seen the original version, it was a good film and a touching comedy. I’m sorry, but I disliked this one very much. Also, I feel like it’s about time that Vaughn try and do something different with his career. By now, he’s just becoming the old guy that never knows when to shut up, stop drinking and let the younger ones around him, be with their fellow younger ones. Good review Dave.